Home / SkinCare / Skinsider | Korean Skincare | Camellia Soombi Deep Repair Night Cream. 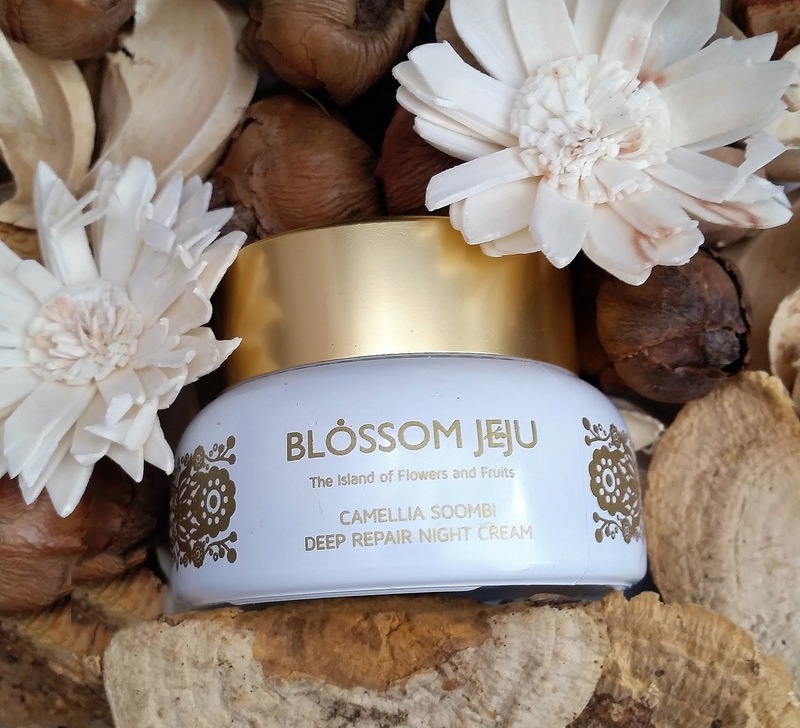 Skinsider | Korean Skincare | Camellia Soombi Deep Repair Night Cream. Camellia Japonica Flower Water - Rich in anti-oxidants, vitamins, phytosqualene, and Omega-6 fatty acids. The skin enhancing benefits this contains is endless and is an excellent emollient and moisturiser, thanks to it containing lipids. The lipids that are trapped in the liposomes contain moisture. When they break, that moisture adheres to the skin surface helping to hydrate it. Caprylic/Capric Triglyceride - Derived from coconut oil and glycerin, is an excellent emollient and skin-replenishing ingredient. It's included in many cosmetics due to its mix of fatty acids that the skin can use to replenish its surface and resist moisture loss. Butyrospermum Parkii (Shea) Butter - Retains moisture by forming a barrier over skin whilst also helping to regenerate skin whilst soothing. Glycerin - Considered a humectant that attracts moisture to the skin helping to keep it moist and supple, a popular ingredient in anti-aging skincare. Camellia Japonica Seed Oil - Containing numerous anti-aging polyphenol antioxidants and a rich source of Palmistic and Omega-6 Linoleic fatty acids, a great moisturiser and emollient used in high-end cosmetic products. Magnolia Kobus Bark Extract - A popular ingredient in many skincare products that helps protect and fight against fine lines and wrinkles whilst offering anti-oxidant benefits. Glycyrrhiza Glabra (Licorice) Root Extract - A great anti-inflammatory and antioxidant that helps to calm and soothe irritated skin. Squalane - The popular ingredient that is an excellent hydrator and can also prevent loss of hydration. Camellia Sinensis Leaf Extract - A powerful antioxidant, anti-inflammatory and anti-aging ingredient known or referred to as green tea extract. Glycine Soja (Soybean) Peptide - Rich in protein, vitamins, minerals and skin loving vitamin E to firm skin whilst offering moisturising benefits. Olea Europaea (Olive) Fruit Oil - High in essential fatty acids it enables to moisturise any skin type efficiently. Opuntia Ficus-Indica Fruit Extract - High in vitamin E and has a rich content of fatty acids, minerals and vitamins, to provide essential hydration and possess anti-aging properties. Chamomilla Recutita (Matricaria) Leaf Extract - Rich in Vitamin B-Complex, it can provide healing, anti-inflammatory and regenerating properties. Centella Asiatica Extract - Rich in amino acids, beta carotene, fatty acids, and numerous potent phytochemicals, the popular ingredient can heal and prevent skin aging. Salix Alba (Willow) Bark Extract - Containing salicylic acid, this natural exfoliant (BHA) helps to shed dead skin cells to help improve skin texture and tone. Aloe Barbadensis Leaf Extract - Soothes skin thanks to its natural anti-inflammatory benefits. Bioflavonoids - Enhances the effect of vitamin C and vitamin E, effectively boosting the function of these powerful antioxidant vitamins in your topical skincare products. Brassica Oleracea Italica (Broccoli) Extract - Hydrates skin by its quick penetrating abilities to provide protection against free-radical damage. Hydrolyzed Pea Protein - A rich source of amino acids that helps to moisture skin quickly, whilst also acting as a tightening ingredient in anti-aging products. Pisum Sativum (Pea) Seed Extract - A natural organic anti-aging ingredient that tackles loss of firmness and elasticity. Scutellaria Baicalensis Root Extract - A natural antioxidant that provides anti-inflammatory benefits and skin brightening results. Hizikia Fusiforme Extract - A skin conditioner that provides essential moisture to skin. Hyaluronic Acid - A popular anti-aging ingredient that keeps collagen synthesis up, whilst also helping skin to retain moisture. Panax Ginseng Root Extract - Full of anti-aging phytonutrients, it also has the ability to tone and brighten the skin. Rosmarinus Officinalis (Rosemary) Leaf Extract - Nutrient rich, it can help protect skin cells from sun damage and free radicals. Yeast Beta-Glucan - Antioxidant properties, whilst also known as a polysaccharides that can provide anti-inflammatory benefits to calm redness and provide relief from irritation. Rosa Canina Fruit Oil - Rich in proteins and high levels of vitamin C, it provides moisture to the skin whilst also improving skin tone, leaving skin soft to the touch. I have only listed and detailed some of the natural ingredients in this Korean skincare product. It must be noted that the Ingredients are subject to change at the manufacturer’s discretion. For the most complete and up-to-date list of ingredients, refer to the product packaging. The camellia soombi deep repair night cream is suitable for all skin types and is free from Parabens, Synthetic Dyes and Mineral Oils. 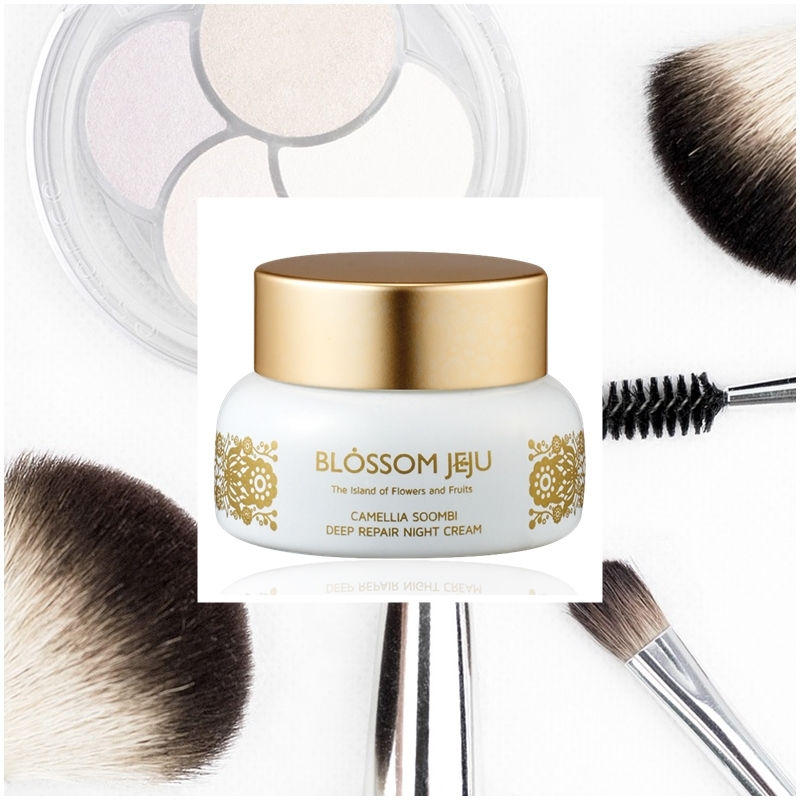 The camellia soombi deep repair night cream is situated in a luxurious gold and white cosmetic jar. The great thing about Korean Skincare is that each product can easily fit into your skincare regime, either by adding a product in, or rotating a product to use sparingly on specific days. Apply any of your serums and gels to your skin, before application of the deep repair night cream. I was surprised of the bouncy, almost air whipped texture, when dipping my clean finger into the jar to apply to my face. Gliding over the skin freely, the cream disperses almost immediately, so you only need a little to use on application. Patting onto skin and using a circular motions helps the cream absorb under a minute and leaves skin perfectly hydrated and glowing. 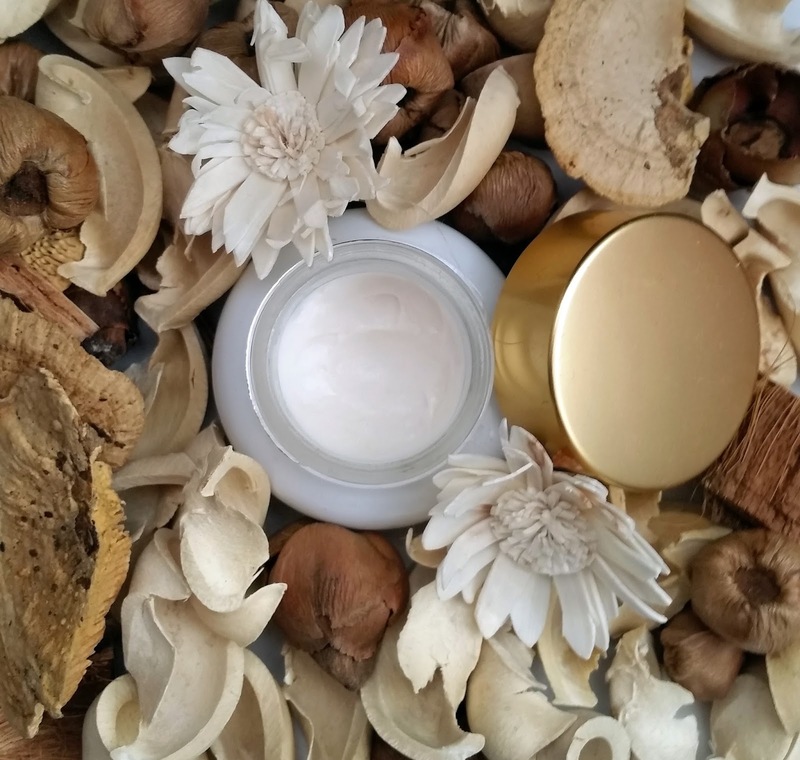 I really like how light this cream feels on the skin, without feeling overly greasy or oily, yet still feels extremely and beneficially moisturising to restore suppleness and elasticity. The lightness of the relaxing scent eases away your days stresses to prepare you for a good nights sleep, whilst your skin will receive a luxurious overnight treatment, thanks to the natural power the natural ingredients can achieve when used in your skincare routine. Discover the natural Korean skincare products and your own true beauty at Skinsider. X Neil. The Organic Pharmacy Retinol Night Serum. Eat And Drink Your Way To Clear Healthy Skin. Emani Miracle 7 in 1 Primer Serum. Black Leopard Skincare For Men.